Claire Holden rode a 30 mile sportive in Dorking taking in the notorious Box Hill. Claire realised she had a puncture at the top and enjoyed this glorious view whilst mending it! Alan Benett tackled the tough but stunning course of the Jog Shop Jog 20. Alan completed the 20 miles in a time of 3:31, he was pleased with his steady paced run round the course and felt he could have continued. Alan is now looking forward to the Beachy Head Marathon. All races are 5 miles with end of series prizes for all age groups. Dates for further races can be found via the link to Sussex Races on the home page. 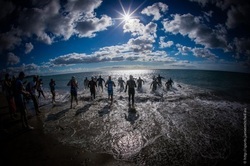 And to finish a stunning photo sent by Lee Holdaway who competed in a small Mtb Tri in Lanzarote. No problems with the weather out there! Well done Lee.